Handmade Sterling Silver Bangle Bracelet from Indonesia, "Unbroken Hope"
Indonesian artisan Komang Suastra handcrafts this minimalistic bangle bracelet. 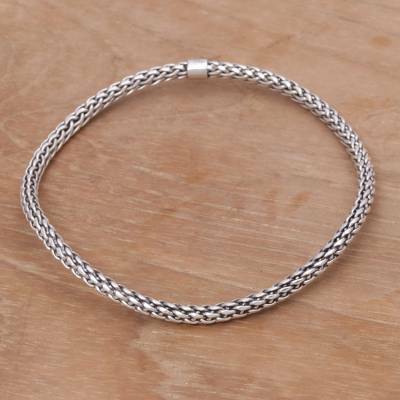 Made from sterling silver, it features an intriguing, unbroken chain link design that has a distinctive appearance. You can find sterling silver bangle bracelet 'Unbroken Hope' by Komang Suastra in jewelry categories such as No Stone Bracelets, Sterling Silver Bracelets and Bangle Bracelets. Enjoy exploring these sections for other Novica treasures.